There are massive and now violent protests going on in Rome at the moment. A journalist friend there says 6 police officers have been injured. Two massive groups, “gli indignati” including high school aged kids, and the “black bloc”, many wearing helmets, are aligned against each other, perhaps 500k at the piazza in front of St. John Lateran. The “indignants” are/were fairly benign, as I understand it, and were peacefully protesting big business, banks, government, blah blah blah. The “black bloc” are essentially leftist-anarchists out to pick fights and hurt people. Think Genova in 1998. Some cars have been burned. Police have vans with water cannons. Tear gas is being used. A supermarket was sacked. La Repubblica has videos. Apparently, some of the protesters marched up the via Cavour wearing Guy Fawks masks, as in “V”. I’ve been watching some of the live video. Pretty nasty. This is effectively urban warfare with a group of anarchists who infiltrated another protest. Again we see idiots wearing hoodies. Remember. This sort of thing is coming to a neighborhood near you. It seems, however, that some of the idiots got into St. John Lateran. On the V. Labicana protesters destroyed a devotional statue of Mary. Another protest by unemployed factory workers is set for tomorrow. Oh joy. Right next to my Alma Mater and the Basilica of St. John Lateran. VIDEO HERE. And HERE. Meanwhile, here in London, thousands rallied in the City and Julian Asange whipped them up. In the meantime, Pope Benedict XVI today spoke to a group called “Fondazione Centesimus Annus – Pro Pontifice” saying, among other things: “We need a new synthesis of family and of work.” I don’t have time to translate the speech at the moment, but he spoke of the need to build societies bonds in the family and not just depend on the state to do everything. As I consider the riots in London, and now this violence in Rome, it occurs to me that the more the family and the meaning of true marriage is undermined by agendas contrary to nature, the more God and Holy Church is shoved out of the public square, and religious liberty threatened, the more we will see this sort of urban warfare breaking out. Perhaps it is good that winter is coming in the northern hemisphere. has anyone clocked that indignati is the Spanish indignados, astroturfed by the old rentamob leftie crowd, reborn as antiglobalization etc, 2 seconds after birth on social media in Spain, who camped out for weeks in Madrid only just before the Pope’s visit this summer. Twas a subgroup of these, with government help, who suceeded in giving The MSM a pretext for reporting other than the Pope. Am I mistaken in believing that the msm oughter be on the index, reading them an occasion of sin, and entertaining belief for half a second in so much as their date, a thoroughly confessable sin? I just did a quick drive-by of the NcR’s website. To no surprise, they support the ‘Occupy’ movement. FYI, Fr. Your video link is causing some dialog boxes to pop up and freeze my PC. I am in Firefox…Now, I’ve been able to close the dialog box and the video starts, not that I clicked on it yet. Firefox users can employ their Task Manager to terminate plugin-container.exe.. In other browsers, it’s tough to segregate and eliminate this program. Idleness is the devil’s workshop. Go to school or get a job! mike_cliffson, please clarify a couple of things about your post. 1) You use the word “clocked” which would be understandable in the sense of timing, such as for a race, but I don’t understand it for your comment about the indignati. 2) What do “astroturfed” and “astroturfing” mean? You don’t appear to use these terms in the sense of replacing a grass athletic field with an artificial surface. In any case, society is in trouble…invest in 4 metals…gold, silver, lead, and brass. Things are okay now in Firefox, by the way. Demonic, proven by the fact that the Immaculata takes the hit. May the Most Holy Trinity, her father, spouse, son, have mercy upon us who insult her. Are about to witness what is shown in the portion of the Third Secret that Rome released in 2000? At noon today there was a “Prayer in the Public Square” gathering in front of the Illinois State Capitol in Springfield — one of many throughout the country. My daughter and I walked down to join them. A group of, I would guess, at least 75 people and possibly close to 100 (I’m not very good at estimating crowd sizes) prayed the Rosary and Chaplet on the steps in front of a landmark bronze Lincoln statue. Kinda neat to see Our Lady of Fatima standing in front of Abe Lincoln :-) There was a good mix of older people and young families there from what I could see, and everyone, of course, was polite, joyful and peaceful. An hour from now, the local “Occupy” group is scheduled to protest at exactly the same spot. (Both groups had permits). It will be interesting to see how the two groups compare. A larger picture of the smashed statue here. There’s no strategic gain to be had from such blasphemy, which will disgust the vast majority of Italians. This is Satanic malevolence. MOST GLORIOUS Virgin Mary, Mother of God and our Mother, turn thine eyes in pity upon us, miserable sinners; we are sore afflicted by the many evils that surround us in this life, but especially do we feel our hearts break within us upon hearing the dreadful insults and blasphemies uttered against thee, O Virgin Immaculate. O how these impious sayings offend the infinite Majesty of God and of His only-begotten Son, Jesus Christ! How they provoke His indignation and give us cause to fear the terrible effects of His vengeance! Would that the sacrifice of our lives might avail to put an end to such outrages and blasphemies; were it so, how gladly we should make it, for we desire, O most holy Mother, to love thee and to honor thee with all our hearts, since this is the will of God. And just because we love thee, we will do all that is in our power to make thee honored and loved by all men. In the meantime do thou, our merciful Mother, the supreme comforter of the afflicted, accept this our act of reparation which we offer thee for ourselves and for all our families, as well as for all who impiously blaspheme thee, not knowing what they say. Do thou obtain for them from Almighty God the grace of conversion, and thus render more manifest and more glorious thy kindness, thy power and thy great mercy. May they join with us in proclaiming thee blessed among women, the Immaculate Virgin and most compassionate Mother of God. Thank you for the update Fr. Z, and I agree, as you stated, that “the more the family and the meaning of true marriage is undermined by agendas contrary to nature, the more God and Holy Church is shoved out of the public square, and religious liberty threatened, the more we will see this sort of urban warfare breaking out.” This is my constant message to my congressional representatives in the US. This is getting frightening. I may be in Canada, but should we be all acquiring the means to defend ourselves somehow? At least deadlier martial arts like MMA, Krav Maga, Jeet Kune Do, and Brazilian Ju-Jitzu (Gracie Family form)? or even worse? 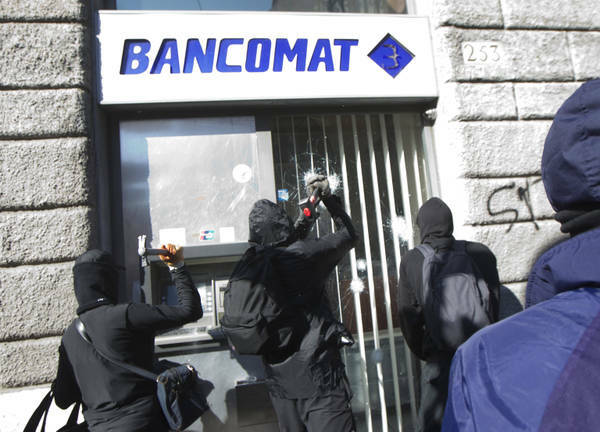 What is interesting is that these rioters see the Church, as an institution, as the same sort of threat as the banks, businesses,and government. Obviously, these people are against all institutions of the West, and are, therefore, true anarchists or Marxists. If you all recall the history of the Ukraine and Russian expansion, the anarchists joined with the Marxists in the destruction of the governments and the Church. 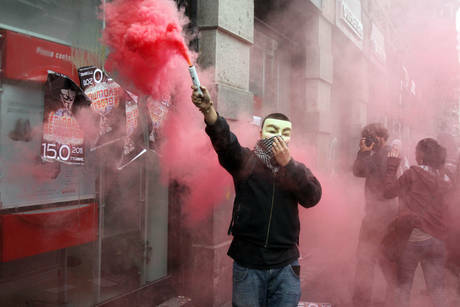 The anarchists also joined with the labor movement in Spain to destroy the government. By looking at these two eras of Western history, we can state that the same is happening now, even in America, where anarchists are joining with whatever group will take power to be, ironically, part of the power base themselves. Not to be cynical, but the present American administration could care less about both democracy and the Constitution if only it stays in some sort of power. Sadly, because these politicians’ souls are at stake, they will fall along with those they have vilified. Such is the fate of those who seem to encourage anarcho-collectivism. There is significance to this date being when this is all occurring. Additionally, these outbursts are also going on in Singapore and getting very bad in NYC. NYPD has its hands full as the Occupy group has been gearing up with help from many sides. The local group here had $190k in their PayPal account this morning. There are getting financial help every single day, pizza delivered, McDonalds on Wall Street closing for two hours a day so they can come in and clean up and wash. This is not what it appears to be. It’s much deeper, sinister and being nudged by forces who hate family, morality, values and anything lawful. The artist who did Obama’s Hope poster did an invite for todays “gala” at the occupied park. Coincidence? Check it out and you will see. Bookworm surely refers to “America needs Fatima”, which organizes noontime public Rosaries throughout the nation today, specifically rosaries in reparation for our outrages. Just got home from my small town’s effort, myself. Ave, Maria. Ok, I stepped outside about 1/2 an hour ago and watched the Occupy Springfield group march through downtown. They filled up an entire city block, so I’m thinking (again, not good at crowd estimates) 800-1,000 people in all. Mostly middle class, white, middle-aged or younger folks (including kids in strollers), beating drums and chanting “The people united will never be defeated” and waving signs that said “End the Fed,” “Money (does not equal) speech,” etc. Didn’t see any signs or slogans that threatened violence toward anyone, just general displeasure with big bad business and government. All processed in an orderly fashion, stopping to let traffic lights change and cars pass. The whole thing was over and everyone appeared to have dispersed by 4 p.m. Personally I think the St. Patrick’s Day parade/bar crowd is more dangerous than these people, but, this isn’t NYC or Boston or Rome, so your mileage may vary. Obviously not EVERY Occupy group is going to resort to violence or disorder, and they can’t all be tarred with the same brush. I suspect many of the people participating in these rallies outside of major cities are just ordinary folk, mostly young, looking for an outlet for their general frustration with the state of the economy. Still, they should be made aware that the movement is in danger of being coopted for more sinister purposes, and they may want to rethink their participation. And Brad is correct; the earlier Rosary rally was an “America Needs Fatima” gathering. Horrifying. Who will protect our churches? Do we now need armed guards lest we fall like the churches of Russia and Europe? Will we be forced underground? Our Lady of Lourdes, ora pro nobis. May God and the Swiss Guard protect our Holy Father. A SAW on the top of one of those trucks would do a lot more than the water canons at putting a stop to the attacks by the violence group. But, no, that would be wrong. It’s very good that cooler heads than mine are in charge. I do believe that people have a right to protest policies they believe are wrong. But if you cross the line and start destroying property and going out of your way to try to hurt people, you are a sociopath. And you need to be dealt with in the only way you apparently understand. Personally I think the St. Patrick’s Day parade/bar crowd is more dangerous than these people, but, this isn’t NYC or Boston or Rome, so your mileage may vary. Everything is fine unless that mob mentality kicks in. It doesn’t even take a large group of people to become a dangerous mob, nor does it take some big city. It just recently happened that a small mob of people in a small northern town in Saskatchewan (pop. about 2000) went nuts and attacked their own RCMP and EMT, torched one of their vehicles, and sent some of the EMTs to hospital with minor injuries. All 16 of their RCMP members were out to deal with it, and no tactical unit available. Never under estimate the power of a crowd of people. All it takes is one stupid person to set a group off. Oh dear, I’m from Australia and all of our bishops are on their ad limina visit in Rome at the moment :S time to pray, methinks! In the States, there are groups of market abolitionists, some are professors at universities, who want to radically change the economic base of America. The list is too long to post here, but you can google either anarcho-collectivists or just economic anarchists and I am sure you will find out at least thirty names of leading American anarchists who thrive on the “black bloc” stuff. These people are against democracy and religion, of course. This whole “occupy” thing has “Alinsky” written all over it, and so it is no wonder Obama endorses it. Now, if there is one force behind this movement (besides, of course, social networks), is the mainstream media – at least in North America. Derek Hunter’s piece at Townhall.com (“Democrats, the Media and the Heart of the “Occupy” Movement”) summarizes the situation in a very straightforward way, much better than I ever would be able to write; take a moment to read it. Of course, we also know that there is a great deal of suffering in the world, and we can help lighten the burden through our charitable works and donations: that is my family’s response to the current events, along with prayers to our guardian angels. Please donate generously to a charity near you when you have a chance! By the way, did you know that Hillary Clinton’s senior thesis was on Saul Alinsky? Wake up, America. An old cop saying is that the best policeman is a cold night. Unarmed individual self defense versus a mob is not likely to be helpful except to let you get away from it if one or two members get rough with you. If the mob in the aggregate is looking for people to beat on, your choices are getting away and using deadly weapons. The story about one Texas Ranger being sent to quell a riot is cool (“You sent only one Ranger?” “You said there was only one riot.”) but you aren’t a Texas Ranger. And your riot won’t be in an anecdote. Another thing about using deadly weapons is the risk of confusing the cops about whose side you’re on, because any riot suitable for you to use deadly weapons against is going to have cops. I have been watching several Italian television channels and have seen the older generation in shock over the damage to their stores, cars and houses. The shrine where the statue of the Blessed Virgin was ruined is even in a worst condition, with a Corpus of Jesus smashed off the Crucifix, so that only His Torso is on the Cross. I saw the anarchists kicking the statue of Mary in the street. One commentator used the term “Communists”, and the authorities do have the names of some of the groups, economic-anarchists and anarcho-collectivists. Most of the demonstrators looked well-fed and wealthy, judging by clothes. This is a false revolution, one contrived by those who hate democracy and religion. One good demonstration today was an inter-religious procession marking the day of the Deportation of the Jews from Rome in 1943. Ironic, is it not, as history repeats itself, because we do not learn from it. I am so sick and tired of these ‘Occupy’ protesters. What do they think they can accomplish by marching in the streets and destroying others’ property? This reminds me of the 1960s-era Vietnam War protests; they were stupid back then, and they’re stupid now. I’m particularly tired of seeing the ‘professional anarchists’ with their masks. Cowards they be, that they don’t want their faces seen! I’m glad that you gave them the right epithet, Father Z: they ARE idiots! 1918 – The US Congress passed the second Anarchist Exclusion Act. 1919 – US Deportation Act for alien anarchists passed, in effect to this day. PS sorry a missing line–the first two dates were on October 15th.